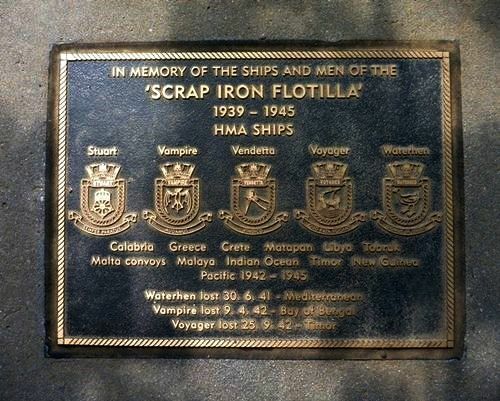 A plaque commemorates the ships and men who served in the Scrap Iron Flotilla during World War Two. The Scrap Iron Flotilla was an Australian destroyer group that operated in the Mediterranean and Pacific during World War Two. The name scrap iron flotilla was bestowed upon the group by Nazi Propaganda Minister Joseph Goebbels. The flotilla consisted of five Royal Australian Navy (R.A.N.) destroyers. The five ships of the flotilla had been Rotal navy ships that had been built and served during the First World War and transferred to the R.A.N. in the 1930s.